All our favorite villains are back and they've banded together! However, our beloved heroes are together again too, this time having to work together to accomplish a mission that could mean the end of their world--overrun by orcs and goblins! Since the cliffhanger at the end of The Novice where Fletcher won the tournament, earning his place at on the king's counsel, Fletcher was also immediately hauled away to await trial for supposedly killing Didric (who's still alive?). Some things get a bit murky or too far-fetched to believe here for the adult reader, but the intended audience probably won't notice. 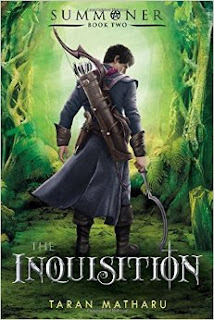 Despite this somewhat muddled beginning with trials and accusations, the real meat of the story comes more than halfway through as Fletcher is back with his team and other summoners along with newcomers and old enemies to journey as four teams to infiltrate the orc stronghold and destroy their horde of goblin eggs. There are still a lot of underlying tensions other than our heroes/villains. The politics of the day have King Harold mostly powerless against his scheming father and the Triumvirate. There's also the rising potential of a civil war between the men, elves, and dwarves as there have been lots of violence perpetrated by supposed dwarf allies or, as accused, the dwarves themselves. With the infiltration of the orc stronghold, Fletcher's team of elf/dwarf allies carries the added weight of the political tension, especially as each team is led by a strong demon who is broadcasting their efforts to their society (i.e. The Hunger Games). Fletcher and his crew have the potential to make or break alliances for their society as a whole, and this tension plays out between their teams and their relationships within the team itself. Quick! I am anxious to read book 3 after another such shocking cliffhanger! (I realize these keep kids reading and are typical for younger grade books, but I find it torturous. *agonized emoji*) Alas, my library currently has a holds' list, so it'll be some time before I can find out and share a review with you all. Happy reading!